I know, so depressing that it will be dark so early :( I totally forgot about the time change, but luckily I didn't have to work today and I accidentally slept in so now it's like I've gained an hour of my life back! It's a good thing they make the time changes happen on Sundays otherwise I bet a lot of people would end up late/early to work! LOVE the slouchy pants these days! So comfy AND cute! Looking super chic in sweatpants, girl! Hope you're enjoying the rest of the weekend! Ha ha, the title of this post totally had me raising my eyebrows... And then I saw the sweats you're wearing, plus the fact that you paired them with booties, and all was right with the world again ;) Loving your lip colour! Haha, I still think the pairing is somewhat questionable but ohhh well! LOL. As a stay-at-home mom, I wear sweatpants in public all the time. However, I never looks as stylish as you do. Girl, if I had sweatpants as chic and as cute as those, I'd wear them everywhere too! You look beautiful! I love the way you've styled them too. Very fashion forward, not a faux pas! I've always had this pet peeve about seeing sweat pants in public...but you are the only person that I think can pull off sweat pants in a cute look. I think it's cause the pants actually have shape and taper towards the bottom instead of just being the usual wide leg or baggy sweat pants. If anything looks like a casual bottom that you kind of dressed up. LIKE!! Super cute, Alison! Those are the kind of sweatpants I think are totally acceptable to wear out, especially with the way you styled them. These don't even look like sweatpants! I have no issues wearing them in public at all! I love your scarf, really cool outfit! love the entire look. you look so gorg! xO! such a great look. those pants are great :) u can totally wear them in public! I wouldn't have even thought they were sweatpants until you said so! You look fab, love the shoes! Love this look! I've totally worn sweatpants out and about. Cant believe those are sweatpants! They look so great! Oh good lord, those croc/ugg boots are like a sign of the apocalypse - some thing should never mate. I think they look stylish! They look great with your blouse and scarf! So classy! Those pants look amazing. That looks really cute actually! I really like the way you style your sweatpants !! Ha ha ha, well, those are definitely the most fashionable sweatpants I've ever seen! You look so fabulous! I love this outfit Alison! And those are some chic sweatpants. You make sweatpants look amazing! Love the sweatpants. I definitely give Wilfred Free sweatpants public approval. lol. omg I hadn't seen the croc/ugg combo until now! haha horrible! you on the other hand look far from horrible - you look downright adorable. I vote yes to sweatpants in public! Great outfit! I would so wear this i especially love the scarf on you! Perfect look for fall!! 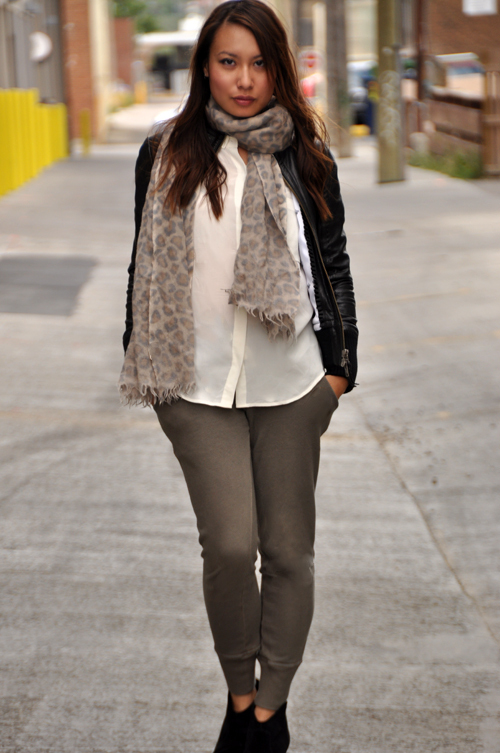 Love your pants and scarf.